Also located on the field is a Chinese temple, which is also used as a collection centre for the Xim Phou Moon association. The association collects old goods and newspapers to be resold for charity. Taman Connaught also houses the longest night market in Malaysia every Wednesday nights at Jalan Cerdas. With products ranging from fresh produce to clothing, the night market is a one stop shopping location for the local residents. I the afternoons, the same street is a hive of activity with the coffee shops being the main attraction as well as thefamous Yip Chee Mei Tai Pau stall. The stall is famous for its huge buns which can serve as a main meal for two people. Further down the road there are two new petrol stations as well as the 24hour drive-through McDonald's outlet. These were built to accommodate the new University College Sedaya International campus, which is located behind the McDonald's outlet. The Giant hypermarket is also a recent addition to Taman Connaught to accommodate the growing community. The Taman Connaught East West Highway divides the area into two parts. The housing area was initially only separated by a trunk road but was replaced by the highway after major development in the area in the last 10 years. The highway leads motorists to the Federal Highway as well as the New Pantai Expressway. 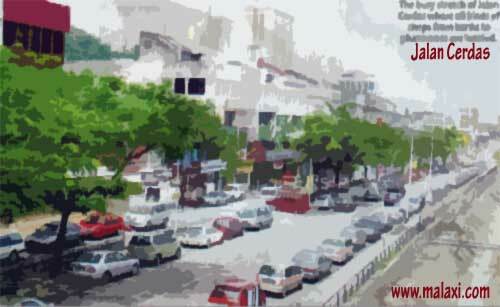 The busy stretch of Jalan Cerdas where all kinds of shops from banks to pharmacies are located. Right across the Taman Connaught highway is where the schools SMK Taman Connaught and SRJK (C) Taman Connaught are located. SMK Taman Connaught is another iconic place for the area where functions and special events are held. Some amenities close to Taman Connaught are Cheras Leisure Mail, the biggest shopping complex in the vicinity as well as the Taman Segar hub which is only a five minutes drive away. The local community can travel down to Kuala Lumpur in 15 minutes using Jalan Cheras, which is now toll-free, and get to Kajang in 20 minutes. However, the one lacking facility is the LRT service. "The LRT service connects areas like Bandar Tun Razak and Taman Miharja but not here in Taman Connaught. The nearest LRT station for us is Bandar Tun Razak but that is still quite a distance to travel to. 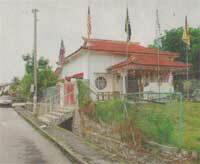 I hope that Putra LRT will include us in future development plans," jenny Cheng, a Taman Connaught resident said. The area in front of University College Sedaya International has amenities like petrol stations, a MacDonald's outlet as well as the Giant hypermarket. On Wednesday nights, Jalan Cerdas is the venue of the longest night market in the country.